This painting overturns assumptions about an artist best known for his bright and joyous view of the world. The portrait is from a period between 1913 and 1917 during which Matisse produced paintings of remarkable somberness and austerity. Nevertheless, these works share a daring level of pictorial innovation that makes them among the most powerful of his long career. The history of this painting began with a portrait drawing of Yvonne Landsberg commissioned in the spring of 1914 by her family, affluent Brazilians living in Paris. Yvonne's brother, an acquaintance of Matisse and an enthusiast of his work, proposed the idea. Evidently Matisse was intrigued by the young girl he was drawing, and he asked the family if he could make an oil painting of Yvonne. The work was carried out over the period of a few months, ending when the Landsberg women returned to Brazil in August shortly before the outbreak of World War I. The process of making the portrait involved a long series of sittings, always attended by Yvonne's brother. Several drawings emerged during the course of the process, and various versions of the painting were done as well, which Matisse continually painted over in order to begin anew. Only during the final sitting did the artist reverse his brush and use its wooden end to scratch the wide, curving lines that radiate from the shoulders and hips of his subject. 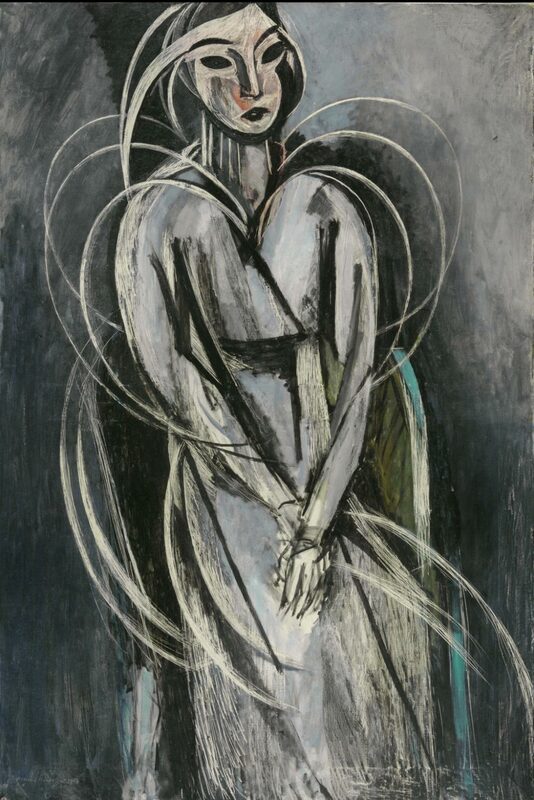 The force of these arcs dominates the portrayal, metaphorically likening the demure young woman to a budding flower. The heart-shaped lines seem to project an energy that her body cannot yet accommodate and suggest the state of becoming that defines adolescence. Perhaps the portrait was too daring for the Landsbergs, who chose not to acquire it. The painting was sent to an exhibition in New York, where Louise and Walter Arensberg purchased it in 1915. Philadelphia Museum of Art: Twentieth Century Painting and Sculpture in the Philadelphia Museum of Art (2000), p. 35.